What does bike share have to do with walkability? There’s a plannerspeak term: “first mile / last mile.” It generally refers to how to get folks to transit stops from actual destinations including home, work, stores, restaurants, and the like. Transit doesn’t offer point-to-point service (like walking, bicycling and driving), so there’s usually some other mode attached to the start and/or end of each transit trip. Most often it’s walking, but there’s also bicycling, shuttles, taxis, and more. Big transportation agencies including Metro and SCAG employ consultants to study and report on the first mile / last mile; see their results here and here. It’s a great issue to tackle. Streetsblog reports on the first mile / last mile every day, though we don’t use that terminology all that often. Mayor Garcetti is pressing for a Los Angeles County-wide bike share system to be spearheaded by Metro. I am all for bike share, and the bigger the better… but… I’ve been thinking that there are some potential pitfalls. Bike share, even at its densest concentrations, doesn’t quite offer point-to-point service. Which is to say that bike share potentially has a “first mile / last mile” problem… but it’s more like a “first couple blocks / last couple blocks” problem. Bike share trips start and end on foot, so the solution to the bike share first/last problem is walkability. I’ve been enjoying riding NYC’s Citibike bike share system. In lower Manhattan it seems like there are stations and bikes every few blocks. It’s difficult to walk a half-dozen blocks without coming across one. I’ve taken dozens of trips on Citibike. The bikes generally get me closer to my destination than the NYC subway, which is quite an accomplishment, given the extensive subway system. But each trip still ends with walking, using at least a couple blocks. In case you’re unfamiliar with bike share, there’s no bike lock. You pick up your bike at a rental station, and you return it to a station. If you’re, for example, running an errand, say buying a book, you can’t easily run into a bookstore leaving your bike outside. For bike share to be useful, there needs to be two stations: one near the start of your trip and one near your destination. Since there won’t be a station in front of every home and every job site, there will be some walking. You’ll need a convenient, safe sidewalk to walk those last few blocks between your station and your destination. 1. Foster multi-modal connections: Bike share and transit dovetail really well. Transit riders disembark their train or bus, and hop on a bicycle to get them close to their destination. With Metro as the parent agency for bike share, it should be straightforward to make space available at Metro rail stations. Convenient bikes located at Metro stations help Metro solve its first mile / last mile issues. Not all Metro stations are equal, though – see below. 2. Focus the system into selected areas: With political interests to be served, there may be a temptation to spread the system out – to pepper a few bike rental stations into every Metro boardmember’s jurisdiction. Without a density of stations in a locale, bike share is unlikely to serve many trips. If we put, say, five bike share stations near every Metro rail station throughout L.A. County, I expect that we wouldn’t get a critical mass of stations anywhere. Bike share would fail to be useful. If we instead select 3-5 areas and cluster large numbers of bike share stations throughout each area – say 30+ stations in each area – then bike share can be useful and successful, and likely to spread from there. Perhaps there can be some sort of competition with areas competing with each other to be selected for initial bike share implementation. 3. Focus on walkability: Ideally, this means that if we want county-wide bike share, then we make all of Los Angeles County a great place to walk! Maybe I should end there. Actually, though, the near-term walkability solution would be to focus bike share in areas that already have plenty of pedestrians. This means places like MacArthur Park, Koreatown, Hollywood and downtowns including Los Angeles, Pasadena, Santa Monica and Long Beach. I am looking forward to bike share in Los Angeles. I think it’s going to get me walk more! I’ve had the opportunity to use CitiBike twice as a visitor. 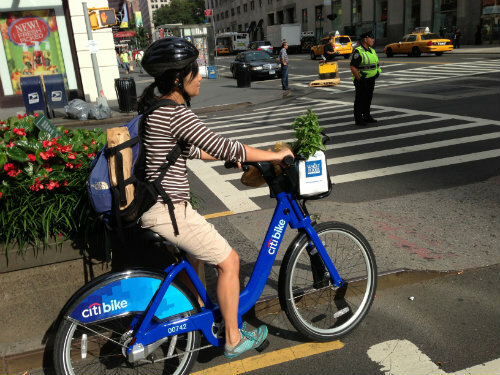 My friends who live on Lower Manhattan tell me that Citibike has changed everything for them. For those that can attend, there is a Metro Bicycle Roundtable meeting scheduled to meet next Tuesday, February 11th, at Metro’s headquarters at Gateway Plaza One on the third floor in the Gateway Plaza conference room from 5:30 PM to 7 PM. Agenda items include updates on bicycle share, bicycle campaigns and planning studies. One thing that is often overlooked – in some dense downtowns, car travel has the same “first couple blocks/last couple blocks” problem. Street parking is very limited, and there aren’t always garages or off-street spaces at every business. In practice, people traveling by car expect to be able to park right at their destination (except when it’s something like the airport), but there are definitely places where that isn’t the rule, and there probably should be more. My advice for L.A.: focus on real bicycle infrastructure, not this bike sharing nonsense. If you’ve never experienced bike share, I’d hold my tongue. As someone who’s always supported it, I was blown away by how much better it was than I expected, even in Salt Lake City where there are only 10 total stations. It’s a legitimate transportation system in its own right, and it has the benefit of being extremely cheap relative to the amount of use it gets (and potentially even profitable) along with providing more impetus for spending on “real” bike infrastructure. This isn’t an either/or thing. Yes, you were blown away by it because of its convenience. The transportation department’s priority is not convenience, their priority is safety. This convenience does not make our streets safer. In addition, it does not benefit the high majority of people who want to ride their own bikes. Oh yeah, and it’s pretty convenient of you to turn a blind eye to the equity issues associated with bike sharing. Am I seeing a pattern here? Their top priority is safety, yes, but it’s not their only one. And according to a recent study, bike share has had a positive impact on NYC’s bike safety, both for bike share users and those that ride their own bikes (http://www.theatlanticcities.com/commute/2014/02/new-york-more-cyclists-has-led-better-biking-habits/8299/). So yes, it does make our streets safer, and it does so in large part by making biking convenient, and therefore more common, and therefore more visible. I’m not sure what you’re basing your comment about most people wanting to ride their own bikes on, but it’s irrelevant either way. Even if you own a bike, bike share can be useful in any number of circumstances. It doesn’t preclude owning your own bike, and using it more frequently than bike share bikes. And I’m also not sure how failing to mention it in a random comment, which was in response to a comment that had nothing to do with equity, is “turning a blind eye.” First, I do recognize that there are equity issues. But I also recognize that there are outside factors (like un-banked residents) that are driving the issue, and that there are cities trying to work on the problem via that angle. Also, bike share is still a fairly new program in the US, and it’s understandable that they’re going to test it first in the areas that it’s most likely to be successful — as that success is further proven, I hope and expect them to expand it into less advantaged areas. Last, for many cities, NY included, bike share is not actually a public expense due to program and sponsorship revenues, so the onus is on constituents to actually push their representatives to SPEND MONEY on bike share, rather than only accepting it if they don’t have to pay anything to subsidize it (like they do with every other transportation mode, at exponentially higher per-capita expense). The program in Paris, France addresses the problem of locking your bike for a minute. They add a choose-your-own-combo bike lock to every bike, which needs to be returned at the kiosk along with your bicycle, using RFID to validate the return.